Maintaining the same accessible and hands-on presentation, Introductory Biostatistics, Second Edition continues to provide an organized introduction to basic statistical concepts commonly applied in research across the health sciences. With plenty of real-world examples, the new edition provides a practical, modern approach to the statistical topics found in the biomedical and public health fields. 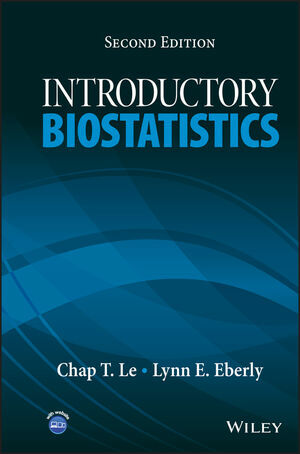 Introductory Biostatistics, Second Edition is an excellent textbook for upper-undergraduate and graduate students in introductory biostatistics courses. The book is also an ideal reference for applied statisticians working in the fields of public health, nursing, dentistry, and medicine. Chap T. Le, PhD, is Distinguished Professor of Biostatistics and Director of Biostatistics and Bioinformatics at the University of Minnesota Masonic Cancer Center. He has provided statistical consulting for a variety of biomedical research projects, and he has worked on collaborations focusing on the analyses of survival and categorical data and, currently, in the areas of cancer and tobacco research. Dr. Le is the author of Health and Numbers: A Problems-Based Introduction to Biostatistics, Third Edition; Applied Categorical Data Analysis and Translational Research, Second Edition; and Applied Survival Analysis, all published by Wiley. Lynn E. Eberly, PhD, is Associate Professor in the Division of Biostatistics at the University of Minnesota. The author of more than 100 journal articles, Dr. Eberly has been a statistical collaborator in biomedical and public health research for more than 18 years. Her current research interests include methods for and applications to correlated data in neurodegenerative conditions, endocrinology, psychiatry/psychology, and cancer research.